Our first official day at Disney, but our second day in Orlando. As excited as we were sleep was hard and we didn’t get much of it. For starters, we woke up at 8:50-9:00 for the 9:50 AM bus; that wasn’t enough time. At least we know for next time that we have to wake up earlier. We got up, changed, and went down to catch the shuttle bus. It was a really cold bus, but our bus driver was funny. The weather wasn’t too bad which we were happy about, not too hot and not too cold. For some reason early in the morning I was experiencing minor discomfort in my stomach, no idea why. Eventually it went away, but I still have no idea what caused it. When we got to Epcot we headed to the ticket booth to grab our tickets, but not before stopping to buy our autograph books and pens. We were a little disappointed that the autograph books hadn’t changed between 2011 and 2014, oh well. After that, we got into the very short line to pick up our passes. I just think Disney is so efficiently run…they have it down to a science. I have to take this opportunity to mention my girl friend Jax, for sending me this awful Confessions of a Disney Employee Whisper style video. It’s where Disney employees’ type out secret confessions they have about their job. It sounds like a lot of them hate their job. So it makes me wonder, whenever I see someone working at a park, whether they hate their job or not. Anyway, when we got our passes we did bag check and headed in. Even the bag check line was efficient. 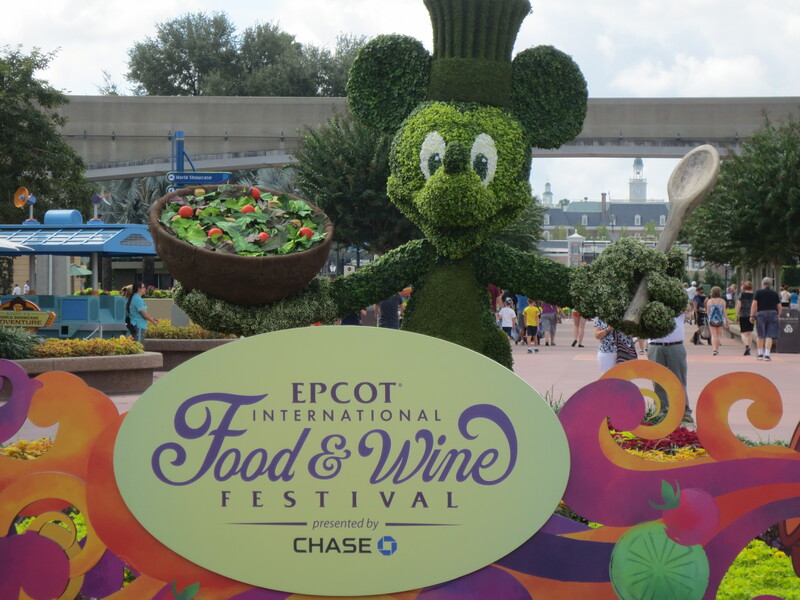 So while we were at Epcot, there was this special event going on called the “Food and Wine Festival”. It’s where you get to sample foods and wines from all over the world around the world pavilion. Only catch, is that you have to pay, obviously. It’s Disney; you have to pay for everything. Immediately, we went in and took pictures with the giant golf ball. Why it’s a golf ball I won’t understand… Since this wasn’t our first time we didn’t need to stop every few seconds and take pictures of everything. But we did stop every so often. We went to the Art Store, saw the awesome fountain that puts our fountain to shame, took a few more pictures outside Food and Wine festival signs and continued in Future World. The first thing we officially did was go on Captain EO – the Michael Jackson experience. It’s Connie’s favourite ride, so I made the effort to get us to it first. Phew, it was starting to get kind of hot, and if it got any hotter I’d have to take out the umbrella. But we got to Captain EO and we ended up having to run, to get in at the last second. Something I noticed about Disney theaters and maybe just Disney in general is THEY SEAT A LOT OF PEOPLE! Obviously they have to, especially during the summer time, but damn, they can fit a lot of people. After Captain EO, we immediately went next door to go on, Journey into Imagination. It was cute cause the Honey I Shrunk the Kids guy, and the Flubber Scientist (aka Robin Williams) was there, like their portraits were on the wall. It was a cute ride, definitely something for kids, but cute all the same. When we got off the ride I felt that having a fast-pass was just something that was convenient to have so that we wouldn’t have to suffer through these wait times. Especially cause the app was being terrible and not working…stupid roaming, even though we paid the extra free. So, I followed my aunt Jay’s advice and we went back to the main centre to get me a fast-pass, it was a bit more money to spend, but I didn’t want to continuously get my card out of my bag, it was so inconvenient. On the other side of Future World is this Energy Show with Ellen that is like….SUPER OLD but still funny cause it was Ellen and Bill Nye and she was on jeopardy and he was helping her learn about energy. Now there was nothing else for us to do but to start our WORLD TOUR. The entirety of the day would be spent walking around the World Pavilion and take more pictures. Most of our pictures honestly comprised of food stalls and menus. Instead of starting at Mexico we started in Canada and worked our way backwards. Canada was not accurate. After Canada we headed into the UK. By that point we needed to stop and have lunch. It was really hot now and I needed my umbrella. Stupid medication that makes me burn easily. There were these really nice and warm scarves from Scotland that I wanted, but I had to resist, as I was going to go there next year anyway. I explored the rest of the shops while Connie watched this like street performance. Eventually we got a table at the Rose and Crown restaurant and ordered lunch. 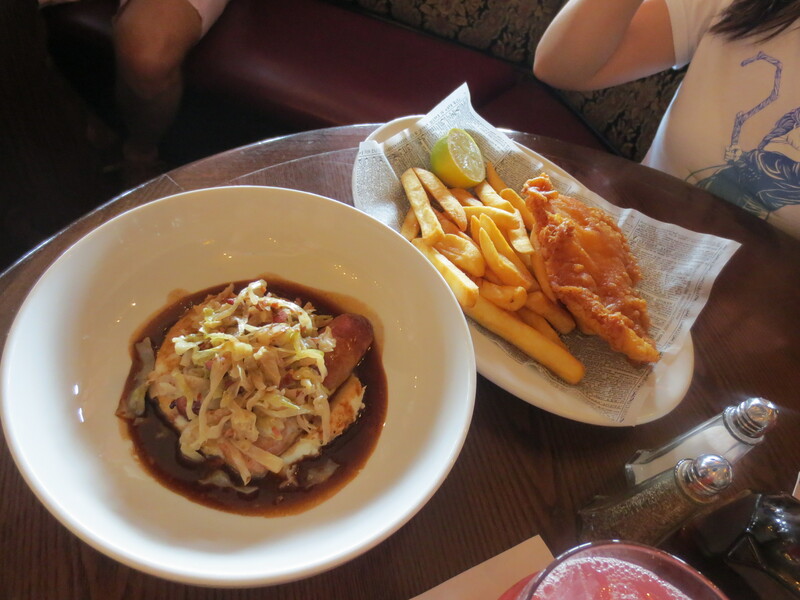 We ordered the Fish and Chips and Bangers and Mash – both staple English foods. Oh my god… it was delicious, of course we don’t have anything to compare it too but still. After we finished lunch we ran across the street to see Winnie and Tigger. I love Winnie the Pooh, but since Connie loves him more I let her have him while I got Tigger ❤ he makes me sad sometimes but I still love him. Onwards and forward we went seeing the World Pavilion. The longest time we spent in a country was Japan. Just because Japan is my love. I love the store there, I love seeing what’s there, and all the interesting things. The only problem is was that EVERYTHING was so expensive. Oh well, I had restrained myself from buying anything which was good. When we stopped in Germany, I couldn’t help myself and started trying on tiaras. I’m not that girly but once in a while I wish I was pretty enough to be girly. The second longest pavilion we stayed at was China – because Connie in Chinese. She took a lot of pictures and was obviously more into it than I was. One cool thing I wanted was my own Wishing Pot, where you write your name on a scroll, put it in a pot and seal the pot. Dumb idea I know but I thought it was really neat. After China, we tried to look for Anna and Elsa cause they were supposed to be at the Norway pavilion but couldn’t find them…so we gave up. Now that we were done, what was left? We had several hours… So with what little time we had, we decided to find the Disney characters to get them to sign our books. Right after Alice, Mary Poppins who was right beside her. Oh man, this Mary Poppins, she was sweet and all, but she was so creepy….that smile though…oh man. It was creepy… like way creepy. Since it was SO HOT and we had no water left, I wanted to get something cold. But before we got dessert we saw Belle was still in France, and I love Belle because she reads. We talked about books and my Library ❤ love her. Then, Connie and I got shaved ice from Japan, well, tangerine shaved ice. I wish it was shaved even more since it just tasted like a slushy…but it was still good for what we needed. Finally, it was our turn for Maelstrom, the only ride on the pavilion. We luckily had fast-pass, but since we were done everything else early we ended up sitting and resting before we went on the ride. We were surprised that it was a 40-45 minute long wait and had no idea what to expect. When we finally got on the ride, we found that it was very short, kind of like the log ride from Ontario Place but like…indoors and with way more updated technology. 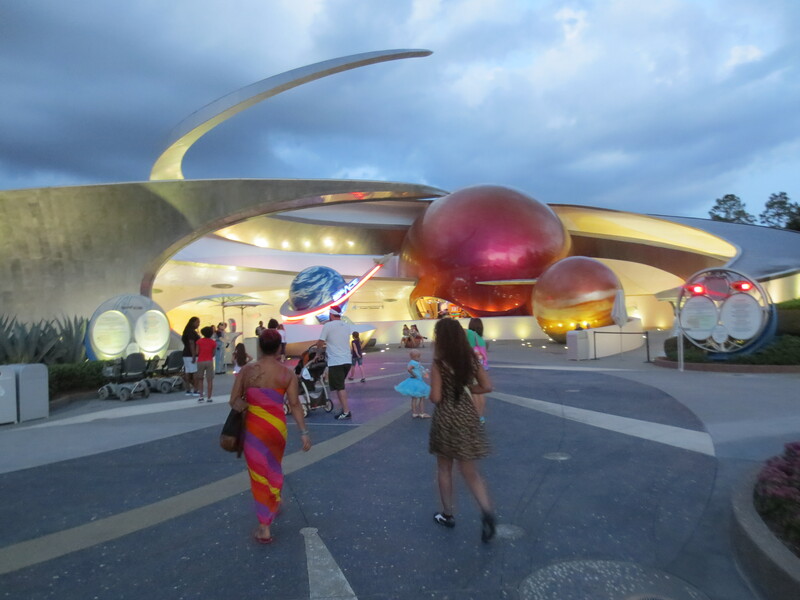 Just before we had to go out to the lagoon for the fireworks show, we decided to go to Mission SPACE, the NASA ride. It was simulation but it was like AMAZING, like you go into a rocket and are blasted into space….man that air pressure was so real it was amazing!!!!!!!!!! Like it felt so real and the wait time was non-existent. After that we played several space arcade games and called it a day. Since we’d done everything already, we ended up sitting down almost an hour before the fireworks. Connie was just chilling; I was staring at the sky. It was very relaxing. The fireworks show was awesome, though not as good as Magic Kingdom’s but it was still a good show. Now onto the long journey home. For dinner we decided to go to TGIF’s cause it was right there, and ended up eating in our room. Lots of leftovers YAY!